Teenage Mutant Ninja Turtles have been making a real come back lately, and if you want to introduce your child to the original episodes or even take a trip down memory lane yourself then you need to check out the “Best Of” Dvds that have been just been released this May. 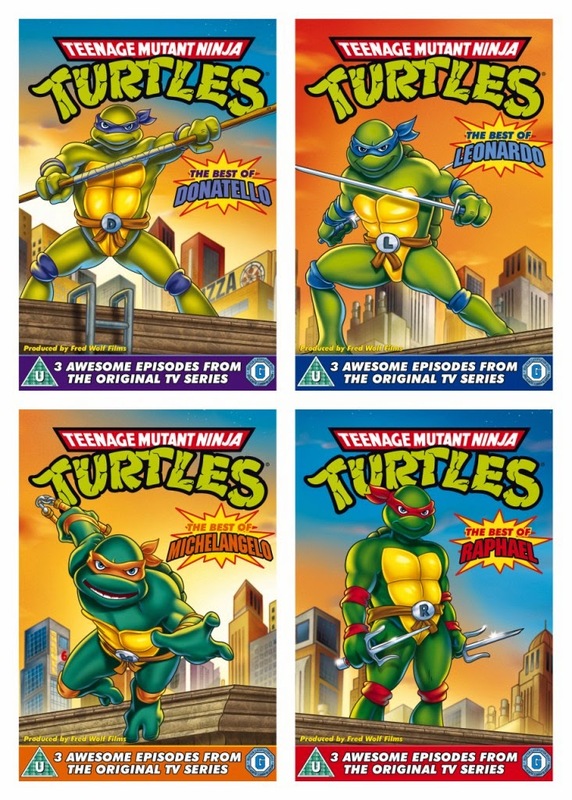 There are four DVDs available, one per turtle and each one includes the three most popular episodes for each turtle, so that you can experience each characters highlights. My boys have recently started to get interested in TMNT as they enjoyed playing with some of the newly released TMNT toys so it was great to introduce them to these original episodes. I remember watching Teenage Mutant Ninja Turtles as a child but these original episodes came out in 1987 when I was not even a year old! It’s amazing how well these cartoons have stood the test of time! The boys were all very interested, and were captivated with the turtles straight away. They will happily watch these DVDs and I have enjoyed watching them with them too! The DVDs are from Lionsgate and will be available from many stockists including Amazon (linked above). They are priced at £6 each which is really reasonable! If you’d like to give the DVDs a try then you’re in luck as I am offering two In The Playroom readers a chance to win one of these “Best of the Original Series Teenage Mutant Ninja Turtles” DVDs each. Each DVD will be a random selection from the four available, I can’t guarantee a specific choice unfortunately but a surprise is always fun! They were on tv when I was little as my brothers used to watch them but I was more into dolls, My Little Ponies and girly cartoons! Yes I watched turtles but enjoy it more now with my son. I loved this programme so much I remember getting dressed for school in front of the TV so I didn’t missed the end! No I didn’t, I’m too old! It was Bagpuss and the Clangers in my day! Yes I did – it was one of the few programmes I didn’t mind watching with my brother. I was kind of forced to watch this when i was younger…but the more i was forced the more i loved TMNT! Just don’t tell my brother that! Raphael! He was the DUDE! My sister loved April O’Neill and even had a doll she named after her! Loved the Turtles! yes i loved them – i had all of the toys! LUCY BISHOP recently posted…Zuccotto: Italian dessert recipe perfect for the weekend! My first DVD was the wizard of oz, and my second DVD was the turtles .. except in those days they were called videos .. and I still have them, but alas, no machine to view them on. My children did and they want their children to watch as well! yes I watched all the time i love it !! I only get to watch them every Saturday when I’m young. Yes I watched it with my kids now I watch it with grandchildren. No, when my son was a kid I watched it ! I watched them with my sons when they were young. God I loved this as a child, watching two episodes back to back while getting ready for school! All the time! I had all the toys as well. No, but my younger brother did. Yes I did watch TMNT although it was generally considered to be a boys thing! I did not but my son did and now his children do. I had no choice but to watch them when it was my little brothers turn with the tello. I did! I can remember very clearly too going to see the first movie at the cinema too with my Turtle mad cousin!! My daughter used to watch it.I grew up watching Rainbow and Playschool. Yes, I use to watch it all the time with my brother. Oh I loved the cartoons – Great! I used to love Teenage Mutant Hero Turtles! my sons used to watch the turtles all the time, now my grandson loves them! No, I am too old! No, but watch them with my boys. Must admit i Watched them as a child and played the video game.. Yes, because they loved pizza almost as much as me. I watched the turtles as a kid and I loved it, also went to the cinema to see the films too!! Used to be a big fan back in the day! T-U-R-T-L-E POWER! I used to watch with my four children. They had the costumes and even though they are now in there twenties we still hang their Turtle christmas stockings up at the fire place every year. yes i did and loved it! Of course , it was the best, also really bonded me and my brother who is 5 years older as he explained characters and other bits! i used to watch it with my big brother at my nanas and grandads and then we would play this interactive TMNT board game they used to have! i loved it! Yep, i was a total turtle fan as a kid. had all the toys and comics and videos. great days.